Citizen-led revitalization efforts have a distinct place in the community development and public safety arenas. They’re often overlooked, as high-profile investments and projects garner more media attention. However, small-scale efforts involving nonprofits can engage communities in planning processes and include marginalized voices that otherwise might not be considered. A strategy for accomplishing this is creative placemaking, which emphasizes community engagement to strengthen connections between people and place by reshaping the public realm to maximize shared value. Nonprofits concerned about public safety and inclusivity should consider the role of creative placemaking in addressing public safety concerns, and its function in bolstering social capital by embracing the physical, cultural, and social identities that define a place. One recent example of a nonprofit utilizing creative placemaking to address public safety is Charleston Moves, a South Carolina-based nonprofit that encourages mobility by bicycle, foot, and public transit for improved health and well-being. As Abigail Darlington writes for the Post and Courier, Charleston Moves partnered with local residents along the 7.8-mile West Ashley Greenway to address concerns around crosswalk visibility at three key crosswalks. Residents were disturbed by motorists ignoring crosswalk signs and wanted to increase the crosswalks’ visibility. The project engaged local artists to create crosswalk murals that incorporated community input and imagery that reflects the character of the neighborhoods impacted. After completing the murals, Charleston Moves installed feedback signs, soliciting community votes on whether they liked the installations; the reviews they received were overwhelmingly positive. A portion of the costs for this project were paid for by AARP’s Livable Communities Program, a national program that aims to answer the question, “Are our communities livable for Americans of all ages?” The program has created a “livability index” and searchable database that comprises more than 50 national data sources and 60 indicators spread across seven categories—housing, neighborhood, transportation, environment, health, engagement, and opportunity—that each have in-depth, localized data. The hope is that exploring data will lead communities to conversations about livability, leading consumers and policymakers to act. Other funders are also interested in creative placemaking’s usefulness in community engagement projects, both in urban and rural areas. 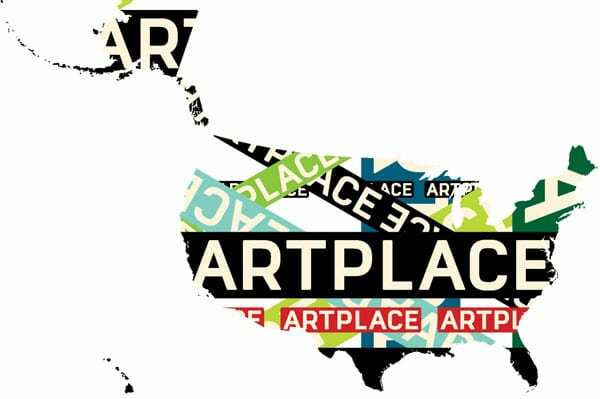 ArtPlace America, for example, is a “ten-year collaboration among 14 partner foundations, along with eight federal agencies and six financial institutions, that works to position arts and culture as a core sector of comprehensive community planning and development.” Part field-builder, part funder, ArtPlace provides a wide range of tools and resources dedicated to increasing awareness and documenting effective community development using creative placemaking practices. ArtPlace also developed a matrix as a guide to frame how arts and culture intersect with 10 core areas of community development, which ArtPlace uses as part of its creative placemaking grant evaluation criteria. Creative placemaking is gaining ground in research as well. As NPQ reported earlier this fall, the Urban Institute released a report in September, entitled Creative Placemaking and Community Safety: Synthesizing Cross-Cutting Themes, that looks at such themes as building resilience and collective efficacy, activating underused spaces, and rethinking institutions. In addition, the report explores implementation challenges and lessons that others can reflect upon and looks ahead to ways to build capacity for evaluation and self-evaluation. Other nonprofits use creative placemaking to catalyze social capital and weave neighborhood connections. In Portland, Oregon, for example, the City Repair Project facilitates artistic and ecologically-oriented placemaking through projects that honor the interconnection of human communities and the natural world. Over the past 20 years, the City Repair Project has engaged thousands of volunteers to create public gathering spaces by assisting neighborhoods in creatively transforming the places where they live. This includes over 60 street paintings throughout Portland, ecological landscaping that integrates permaculture design, and natural building projects that use minimally processed and renewable natural materials. A unique component of The City Repair Project is its engagement strategy, where it solicits applications from community groups interested in utilizing its services and approach to creative placemaking in their neighborhoods. The application process leads to the selection of projects throughout the city, and the group facilitates a 10-day barn-raising event called the Village Building Convergence. Power Shift: How Will Nonprofits Respond to the Rise of the Mega-Donor? Do we need a statement of ethics for the recipients of donations?